Recently, a Korean modder named Renn has created an MCM version of Amazing Follower Tweaks, created by Dheuster, in Korean version only. That is not fun, since we English speakers deserve some MCM feature on AFT as well. So I simply translated the Korean version into English, and got an approval from the original author, Dheuster. "Go for it if you have the time....=)"
Since I am not the developer of the MCM version, I can not provide any technical support. This mod won't run without the original mod. 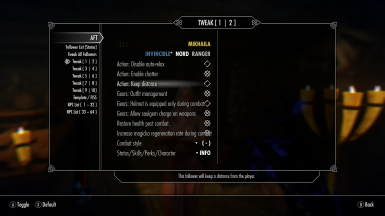 It is safe to install this mod on your existing save file that runs the original AFT. There could be a small glitch on the shortcut/FISS menu. Nothing wrong with the functionality, but it could be confusing. 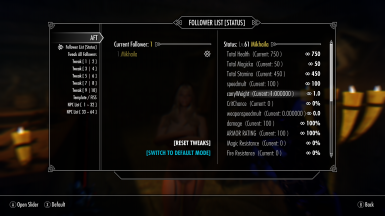 Don't forget to endorse the original mod, Amazing Follower Tweak!